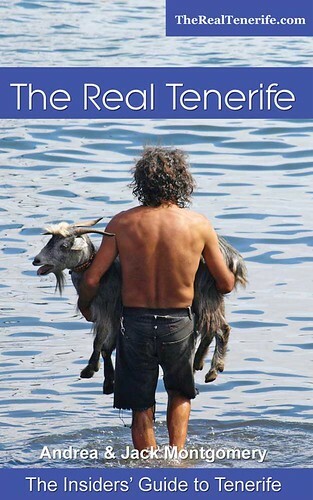 Legend talks of a young Guanche princess named Guajara who, on hearing of the death of her husband in the Battle of Aguere, chose to throw herself from the top of a mountain rather than live without him. 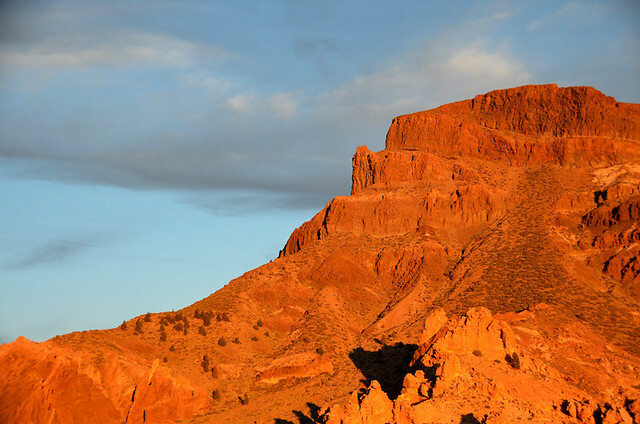 Every evening, as the sun goes down, the mountain turns red, tinted by the blood of Guajara whose name it carries in her memory. Watching the sunset burnish orange on the craggy face of Alto de Guajara, it’s impossible to trace the path that allegedly leads from its summit to the crater floor directly behind the Parador. So as we set out from the hotel the following morning, we’re not entirely sure what lies in store for us. We’ve climbed Alto de Guajara many times, taking Sendero 5 off Siete Cañadas to reach Degollada de Guajara and up to the summit from there, but have always returned by the same route. A year or so ago we were about to descend to the Parador from the crater wall, having walked from Vilaflor, and an elderly couple arrived alongside us, having descended from Guajara. If they could do it, so could we, and we could turn our route into a circular one. That was our mission this morning. We had barely crossed the Parador turning circle when a woman from the tourist information office alongside the hotel stopped us and informed us that Siete Cañadas was temporarily closed from the point we were intending to join it, all the way back to its junction with Sendero 30, opposite the Minas de San José. She suggested an alternative route but it would mean going and returning the same way. Given that we were already on the trail, we had little choice but to go with her suggestion. 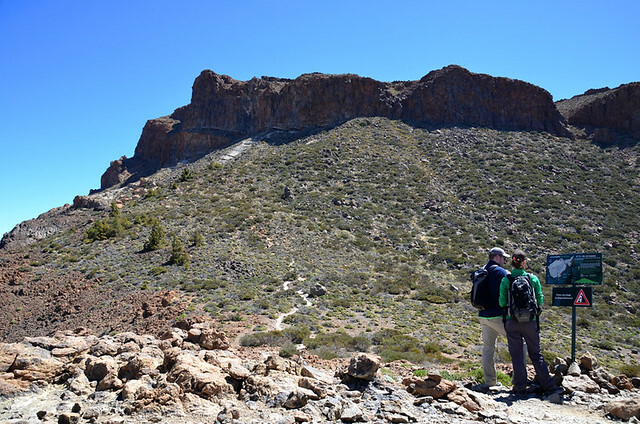 Just completed, and re-labelled as a continuation of Sendero 15, the new route would take us up the face of the crater wall to the ridge and then up again across the north west face of Guajara. We quickly realised this was the route we had been hoping to find and although we were having to do it both ways, once completed, we could join up our existing route to make it circular. Adversity had just turned to our advantage and we set off with a spring in our step and a chill in the morning air which was yet to be warmed by the sun. Reaching Siete Cañadas, a fence barred our usual route and tunnelled us straight across the barranco, heading towards the crater wall. 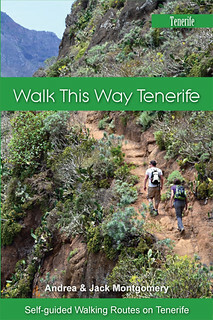 This was the route we had descended on our linear walk from Vilaflor to the Parador so we knew from experience it was going to be a formidable climb. 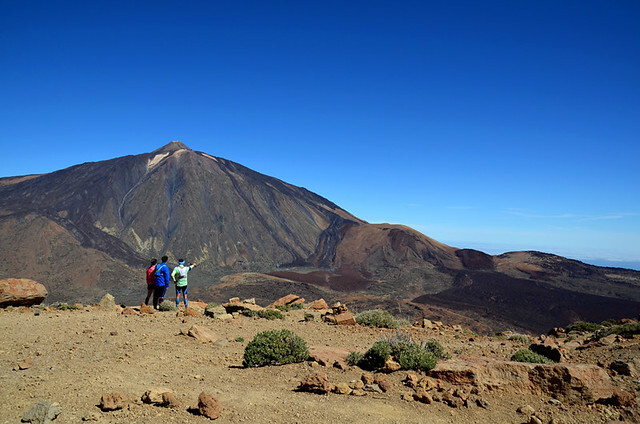 Despite having been in Teide National Park for the previous 24hrs, it was surprising to find that, once we began to climb, we could feel the effects of the altitude and to begin with, our pace was measured. As our lungs got used to the oxygen levels and the sunlight snapped at our heels as it crept across the landscape, our pace quickened and our fleeces came off. Below, a string of walkers in a guided group who had set off just behind us gave scale and perspective to the route; we had gained a lot of height in a short time. Reaching the ridge, we arrived at an information board detailing the new route. Much to our surprise and it has to be said, confusion, it showed that the route was expected to take 2hrs and 30mins. No distance was given. 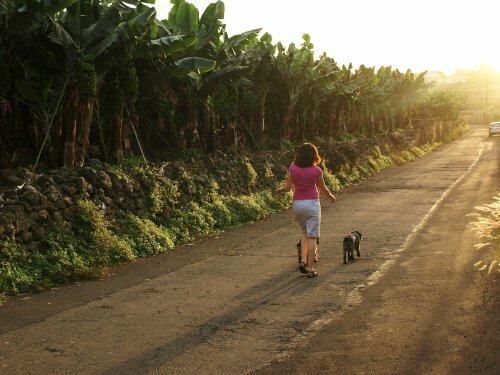 We couldn’t figure out how it would take so long but as we’d never walked it, we couldn’t be sure where it would lead. Mentally regretting not having brought any more sustenance than a couple of energy bars and two satsumas, we set off. The path began gently enough but soon began to show its credentials as loose scree coating the path, and boulders too far apart for stepping, stretched muscles and kept eyes firmly on the ground immediately ahead. Short, flat sections provided respite for tired legs as we zigzagged up the mountain. Far below, we could see the guided group taking a prolonged rest on the ridge and three trail runners emerging from the first leg of the climb. After 1.7km of steady ascent, the path levelled out and we could finally enjoy the widescreen views that surrounded us. 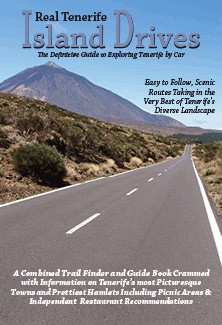 This was a face of Teide National Park we had never seen before. 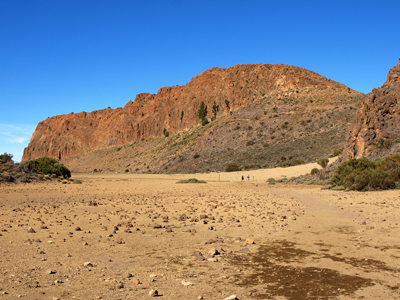 Below us, the dust coloured crater wall ran south above the basin of the Ucanca Plains like a pastry crust around a mulberry pie while on the horizon, the shimmering outlines of La Palma, La Gomera and El Hierro lay. 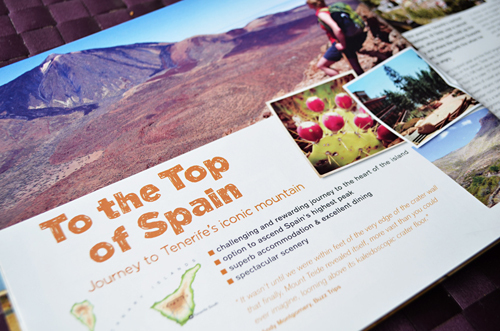 As we reached the crest, Gran Canaria showed herself above the thin veil of cloud that hovered above the ocean. 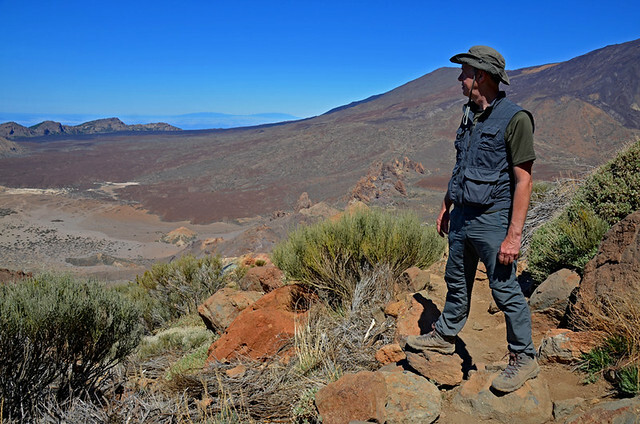 Reaching Alto de Guajara, we were struck once more by the humbling presence of Mount Teide and Pico Viejo which dwarfed our very existence as human beings. It doesn’t matter how many times you climb to this view, it will never disappoint. Almost forgotten alongside the epic scene that lies ahead, the derelict remains of the world’s first high mountain observatory lie behind us providing a sheltered spot in which to enjoy a snack before setting off on the return leg. I can’t say I was looking forward to the return path, some of the loose scree and steep steps we had encountered on the way up promised to make for a tricky descent. Amazingly, it didn’t turn out to be so. Certainly we had to take it easy on sections where loose stones threatened to morph into marbles below our feet but the steep steps were actually far easier to negotiate on the descent than they had been on the way up. I was surprised to find myself, just 40 minutes later, on the ridge and heading back to the information board. Sendero 31 which drops from the ridge to Siete Cañadas resembles the start to a toboggan run when you approach it from the top. It’s an intimidating prospect. 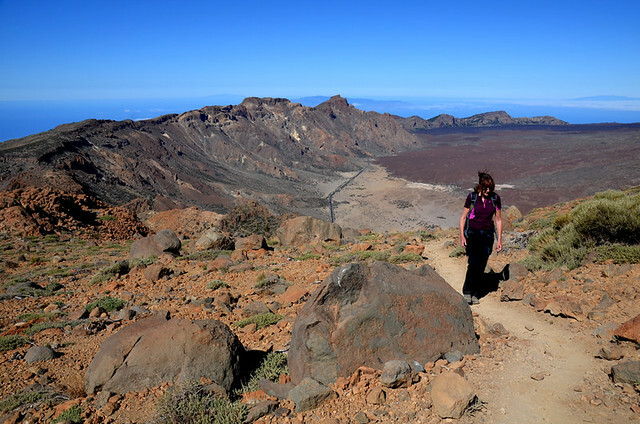 But the narrow path quickly opens up and, apart from some more loose scree sections not far below the ridge, soon settles into a pleasant zigzag back to the crater floor. Over Siete Cañadas and back to the Parador café for a quick snack before heading home. 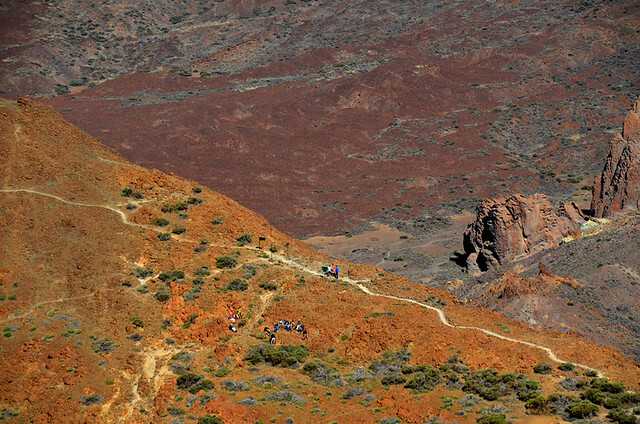 The new circular route to Alto de Guajara is now incorporated into our Hiking Highs Island Walks. 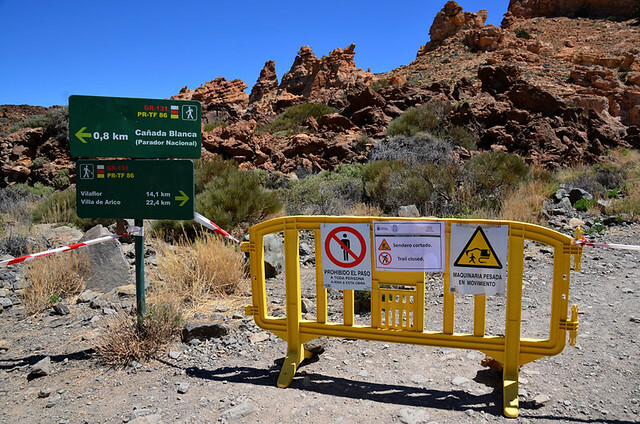 NB As long as the Siete Cañadas path remains closed, the route can only be done by taking the return route both ways. We will post an update as soon as we know the paths have re-opened.